No, Christmas is Not Pagan. Just Stop. Well, it’s time for a good Christmas rant. This requires a rant, because every year, we see the same ignorant silliness. (Sorry, but it’s just true.) Supposedly, Christmas is secretly pagan, secretly syncretist, secretly a co-opting of pagan stuff and ignorantly claiming it to be Christian. But the truth about these things is so available that it’s literally staring out at you even from Wikipedia. Is this about the Christmas tree? What if I told you that most Christians throughout history did not celebrate Christmas with trees? Christmas trees have started to spread all over the world, but that is a recent development and not something most Christmas-celebrating Christians would have even heard of for most of history. Christmas trees were a purely localized phenomenon for a long time. And it’s not like pagans invented trees or even invented cutting them down and bringing them inside. Are you really saying that pagans own trees? And mistletoe? Really? You think that Christmas hangs upon mistletoe? So provincial, you guys. So, yes, you can have Christmas without Christmas trees (or mistletoe). Most Christians always have. Like the Eostre/Easter connection (which is only made in a handful of countries with Germanic languages; most languages use some variant of the Hellenized Hebrew Pascha), this is really just about the name of a month getting associated with a big festival that happened to fall in that month. And do you really expect me to believe that burning a log in a fireplace has some unbreakable pagan connection that Christians just shouldn’t do? Like, burning logs is pagan? Maybe Christians would like to be warm, too. Yes, there was Germanic pagan Yule stuff. But Christmas has as much to do with pagan Yule stuff as as the Fourth of July has to do with the deified Julius Caesar (for whom July is named). So, yes, you can have Christmas without anything to do with “Yule.” Most Christians always have. Is this about giving gifts? How is giving a present pagan? How is giving presents on a holiday pagan? Just because there is a similarity between two things doesn’t mean that one is a cause of the other or that one is based on the other. Correlation doesn’t equal causation. And what if I told you that giving presents on Christmas is not a universal Christian practice? Yes, there is such a thing as Christmas without presents — and not just when you threaten your kids with it, either. So, yes, you can have Christmas without presents. Most Christians always have. Hey, I lament the commercialism. I do. But it’s just sort of dumb to claim that people who celebrate Christmas badly have successfully co-opted the feast day. So I don’t know how this one got in here, but I’ve definitely heard people call Christmas shopping and all its modern American insanity “pagan.” But whatever. So, yes, you can also have Christmas without crazy Christmas shopping. Most Christians always have. Is this about Santa Claus? Look, Santa may not be real, but St. Nicholas sure is — he was a fourth-century Christian bishop in what is now Turkey. How did he get mixed up in Christmas, anyway? It’s because his feast day is December 6, which is just a few weeks from Christmas and thus during the Nativity Fast (a 40-day fast that begins on November 15). And like any good Christian saint, he did indeed help poor people with gifts, but they weren’t toys or candy but rather money to rescue people from being sold into slavery, etc. And did you know that in some Christian cultures, the home-visiting, gift-giving saint is a different guy altogether? In Greece, for instance, it’s St. Basil, and he doesn’t come on Christmas but rather on January 1, which is his feast day. So, yes, you can also have Christmas without Santa. Most Christians always have. Is this about December 25? Rather, December 25 was arrived at because it was exactly nine months after March 25, when the Annunciation was being celebrated, which is the feast of Christ’s conception in the womb of the Virgin Mary. Christmas on December 25 isn’t a claim that Jesus was born on that day or even an attempt to claim a pagan holiday and make it Christian. It’s about a feast that was set to be nine months before. So, yes, you can have Christmas without December 25. And for a long time, most Christians did. Well, that was originally on December 17 and eventually extended through December 23. Are you saying that that week in December that happens to fall near Christmas on December 25 makes Christmas pagan? Really? This would be like saying that, if your birthday falls around the first weekend of September, you must belong to the organized labor movement because your birthday is near Labor Day. Facepalm, folks. Is this about the winter solstice? Before the introduction of Sol Invictus in AD 274, there were no pagan solstice celebrations going on near where Christians were. (True story.) But surely a reference to something happening in nature ought to be considered pagan and not Christian! Says who? Are you saying that Christians ought not pay attention to the rhythms of the natural world that they believe God created for His people to live in? Really? Nature stuff is pagan? Please. While it is true that Christmas was not set for December 25 because of any solstice connections, there is still something beautiful and poetic about celebrating the “Sun of Righteousness” (as an Orthodox hymn of the Nativity calls Jesus) as He “rises,” so to speak, into the world. This is not a cause of the Christmas celebration, but it certainly is a natural poetic way to celebrate it. But let’s not forget our brothers and sisters in places like South Africa and Australia, whose Christmas is a rather warm affair with air conditioners and beach visits and such. So, yes, you can have Christmas without winter solstice stuff. Most Christians always have. Is this about religious holidays in general? The idea that certain days should be set aside for special religious occasions isn’t unique to pagans. Ancient Jews did this, too, and were even commanded by God to do so. So when early Christians decided to start having Christian feast days, they did so originally based on the Jewish inheritance, celebrating feasts such as Pascha (a new, Christian Passover, celebrating the resurrection of Jesus) and Pentecost. Marking time with religious significance isn’t pagan. It’s just human. To deny this part of our religious consciousness is essentially to deny that time and creation in general can be sanctified by the presence of God. Is this about [insert any other symbol or custom that has been associated at some point with some pagan religion]? You might well be right that that thing was once upon a time associated with some pagan religion. But we Christians are all about baptizing people (and, metaphorically, other things) and changing them to be Christian. Christianity is the religion that’s all about changing stuff and making it Christian. So even if that thing was once pagan in some way, we’re taking it and making it not pagan now. So there. That’s what we do. BAM. It’s not pagan any more, that thing. It’s been transformed. So it’s Christian now. Now, even though some custom or other might have once had an association with paganism, the feast of Christmas itself does not have its origins in this practice of baptizing formerly not-Christian stuff. It’s not a co-opting and changing of anything, unless you’re talking about humanity itself. Christmas is definitely all about reclaiming humanity itself and making it conform to Jesus Christ, and His birth is definitely a big part of that project, because any sanctification of humanity will include this most basic and universal human experience — birth. So as you can see, my point here is not that there has never been anything that was once associated with paganism that now is used by Christians (though not as many things as are claimed). Rather, those things don’t make Christmas pagan, and it’s especially silly to make that claim about things that are regional in space and/or time. Is this about not believing in Jesus Christ? Look, if you don’t believe in Jesus Christ, that He is truly the God-man and the Son of God, that He came into this world to destroy the power of death and make a way for us to resurrection and healing, I get it. But don’t claim that this stuff is pagan. When we Christians say that we worship Jesus Christ and celebrate His birth because we welcome His coming into the world, we really mean it. We’re not worshiping anyone or anything else. If you want to be pagan, be pagan. If you want to be an atheist, be an atheist. 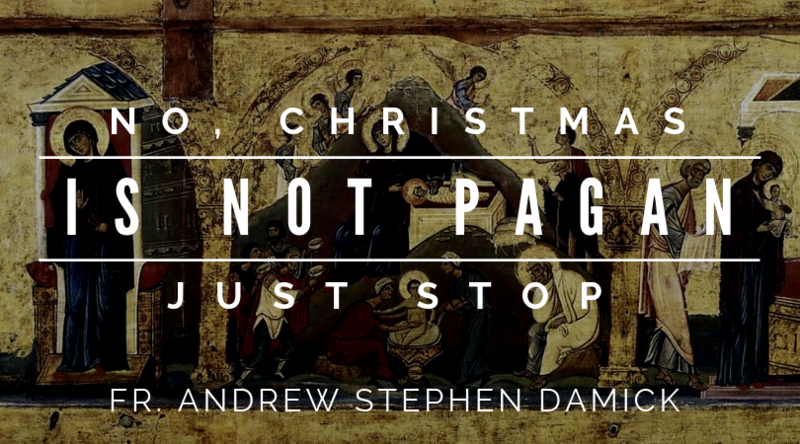 But if you’re a Christian, you can rest easily knowing that Christmas isn’t about paganism. It’s just not. And if you are a pagan or an atheist, I’m not going to stop you from being those things, but I definitely do invite you to be baptized into Christ so you can celebrate the real Christmas with the Christians. Is this about going to church? Well, you’ve got me there. It turns out that Christmas is about worshiping Jesus Christ, and you can’t do that in a truly Christian way without coming together with other Christians to pray and (for most Christians in history and even now) to celebrate the Holy Eucharist together. So, no, you cannot have Christmas without worship. And most Christians never will. And those who do, including those who actually cancel church services when December 25 is a Sunday (I wish I were making that up), you have a problem. You are not doing Christmas rightly. You are doing some other thing. Get to church and do Christmas. And then do the eating and whatever else after. Okay, rant over. Worship Jesus. Have joy in His birth! He’s come to destroy death! Kick it. The Very Rev. 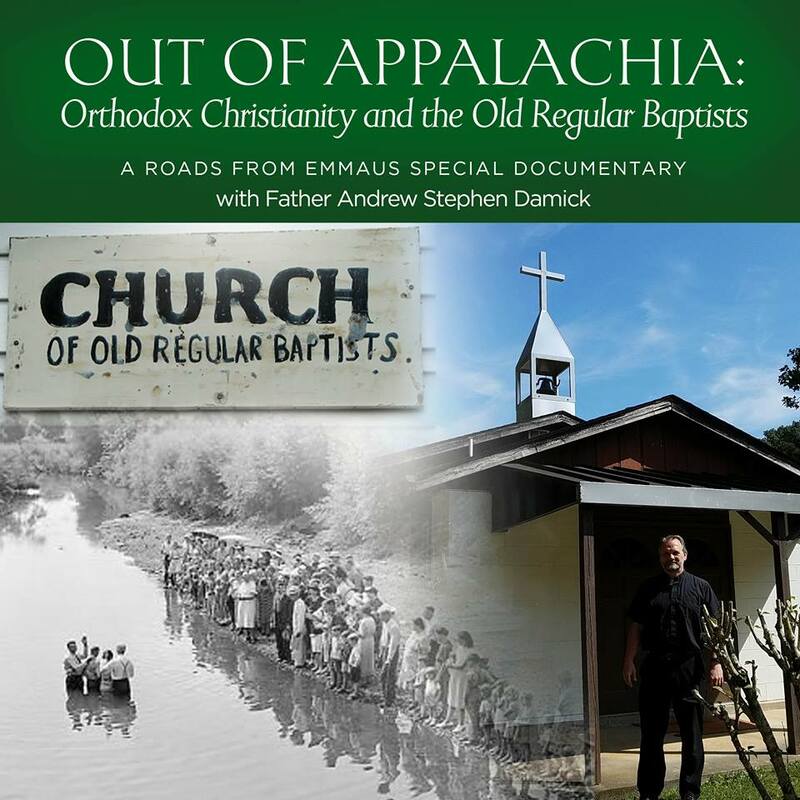 Archpriest Andrew Stephen Damick is pastor of St. Paul Orthodox Church of Emmaus, Pennsylvania, author of Orthodoxy and Heterodoxy, Bearing God and An Introduction to God. He is also host of the Amon Sûl, Orthodoxy and Heterodoxy and Roads from Emmaus podcasts on Ancient Faith Radio, co-host of The Areopagus podcast, and he is a frequent speaker at lectures and retreats both in parishes and in other settings. You can follow him on Facebook and Twitter. "We have to begin building our own institutions." Everybody knows you get your presents tomorrow morning on Sinterklaas. I mean seriously. Father, I think you meant to say St. Basil’s Day…. I don’t think so — he’s Dutch! I love this! Thank-you, Father Andrew! May you produce many more rants, Fr. Andrew! Thank you. I love this. I love you. No ponies involved. Bravo Father Andrew! You have outdone yourself this time! Wow! Tell it! Thank you! Amen! Just a note that “sun of righteousness” is Scriptural — Malachi 4:2. Indeed! And beautifully applied to the Nativity in that apolytikion. Wonderful article, Father. We should also point out the date of Christmas had nothing to do with the winter solstice or the pagan festival of Sol Invictus. It appears to have been derived from the date of Christ’s conception on Annunciation, which early Christians believed occurred on the same date as His Crucifixion, which they all knew. Counting nine months from that date brings us to December 25 (January 7 on the Julian Calendar). Yes, that’s all in the link included in the section on Dec. 25! I wish I would have read this when I was a teenager! I believed this malarkey for several years and was convinced that my parent’s tree was demon posessed. It kept me from finding the church sooner and unfortunately, I still have friends pulled into such delusions which I think are actually pulling them further from Christ in their attempts to be so correct and self-righteous. That is the danger I see. So glad I found Christmas! Thank you Fr. Andrew for being willing to speak the Truth. It often gets very difficult listening to ‘Christians’ who if they speak at all spend their time apologizing for the Truth. We who are of the Body of Christ were given the Holy Spirit to be empowered, not to be weaklings. Not that we need to or should adopt the tactics of the world or to argue, Heaven forbid. But, we like our Savior need to be able and willing to call a falsehood what it is and acquire the Divine Knowledge of our Mother the Church to back up what we say. Martyrdom? Yes, that what we are called to if need be. You are amazing Father & always a wealth of learning & taking me on a fresh journey to Christ Jesus. Bless you for this rant. I’m curious, can you find one scripture where the disciples and apostles kept a day celebrating the birth of Christ? Paul said, “Follow me as a follow Christ”. Paul never kept such a day, so, I’ll follow him and make sure that my family and I stay away from pagan holidays. You’ll also love this, we only keep the holidays found in the Bible. You know, Passover, feast of unleavened bread, etc. because after all, Christ and Paul kept these days. I’ll wait for a biblical example of the importance of keeping Christmas. I’ll be waiting for a very long time “Father”. Ha! I am Roman Catholic and I love reading your rants. Father keep the articles coming! Should It Matter To Christians When Churches Burn?